Fatherhood and his responsibilities as the elder son have made university executive Tan Chin Hock reorientate his life and make some hard financial decisions. He had always felt it was his duty to look after his parents in their golden years. Mr Tan, 35, said he was blessed that his then girlfriend had no objection to them living with his parents after they got married. "We've had to make some adjustments but I don't consider them sacrifices because it's my responsibility to take care of them," he says. The arrival of their first daughter in January 2011 also called for some major adjustments. "After becoming parents, we dine at restaurants less often and agreed that my wife will go back to work after my second child turns one. "The extra source of income will help our family lead a more comfortable life." 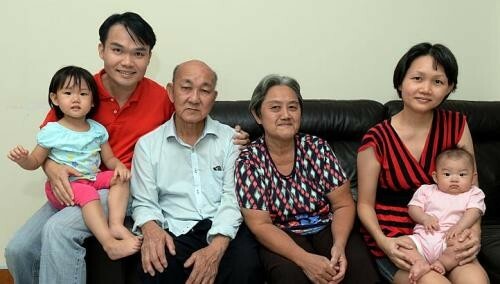 Mr Tan lives with his parents, wife Geok Hong (Madam Choo) and two daughters, aged two and three months, as well as their maid in a four-room Housing Board flat. Fatherhood also prompted Mr Tan to give up his "4-D" gambling habit, saving him up to $60 a week. As the sole breadwinner, he has to provide for three generations. Insurance coverage has formed an important part of his financial planning following a medical scare a few months ago. "My wife was due for a check-up with the gynaecologist a week after delivering our second daughter when she suffered massive bleeding," he recalls. "We called for an ambulance to take her to the accident and emergency department, and she had to be warded for two more days." Although his wife had bought an insurance plan about 10 years ago at a monthly premium of $100, they could not make any claim on the policy. "We dug out about $2,000 from our savings for her two-day stay in hospital," says Mr Tan. "It dawned on me that our savings could easily be depleted in a medical emergency or serious bout of illness, and I did not want to burden my family with the bills." He then upgraded his insurance plan to provide better coverage for his dependants. Mr Tan, who grew up in a close-knit family, has started a non-profit initiative - Holdinghands.sg. He uses the website to encourage youth and working adults to spend more time with their parents and promote active filial piety. "Many times we're busy with work or caught in the rat race," he explains. "But they are fading away every day, and if we don't treasure this time with them, we won't get a second chance." He happily recounts how his 59-year-old mother enjoys spending time with him, even if it is shopping at the nearby supermarket. Definitely more of a saver and on the thrifty side. I set aside 30 per cent of my salary for investments. My dad was a lorry driver and was retrenched when he was 50 years old. That resulted in the family losing about two-thirds of our household income. That episode has made me watch my spending. About $800 for both personal and family expenditure. I'll charge everything to a single card so we can accumulate reward points, and make sure I pay my bills on time. I have several investment-linked unit trusts as well as insurance policies to act as a forced savings and safety net for my family. I've also some money in Myanmar-linked stocks as I believe in the upward potential as the country develops and progresses. My parents were the thrifty sort and taught my elder sister, younger brother and me to be content with what we have. They gave us each a piggy bank very early on to encourage us to save our pocket money as well as the money in red packets we collected during Chinese New Year. I was first introduced to unit trusts as an investment by my friend, who was also a financial adviser, when I started working in 2002. Although the returns were not as high as for stocks, I did not have the time to monitor the market and opted for a product better suited to my risk appetite. The product I bought into had exposure to the China and India market, which I believed had more potential to grow and develop. A four-room, 1,011 sq ft Build-To-Order flat in Punggol, where the seven of us live. It cost about $290,000. A Korea holiday with my wife for our honeymoon when we spent about $6,000 because we bought gifts for all our family members. I hope to keep working for as long as I can to keep my mind active, but definitely at a job that isn't as strenuous or taxing. If my wife and I have a combined income of $4,000, that should be enough for a comfortable life. Our flat in Punggol, which is less than a five-minute walk away from the Punggol MRT station. Living close to an MRT line also helps make it convenient to take public transport. When we have family outings, my younger brother, who drives, will give my parents a lift.